Hemostasis in the closed environment imposed by minimal access surgery is one obstacle blocking progression to more complex intracorporeal techniques. The ability to maintain a clear surgical field allows complex tasks such as suturing to be performed (23). Some of the instruments discussed in this chapter are essential components to the surgeon's hemostatic armamentaria. There are five basic modalities at the surgeon's disposal for the augmentation of local hemostasis (Table 1). These are in addition to the methods of systemically altering the physiologic clotting parameters that might facilitate hemostasis. Vascular pedicles have been safely ligated and divided by autostaplers for two decades (24,25). The concern for arteriovenous fistula development is certainly worth consideration, especially if both structures are taken en bloc (26). The vascular autosta-pling devices are theoretically designed to separate the artery and the vein prior to fixing into the staple delivery mode. The laparoscopic autostaplers have little clinical data yet to support their widespread applicability. Laboratory studies indicate that it is crucial to anticipate the trajectory necessary for delivering the 12 mm device to the targeted pedicle vasculature. The wrong approach results in untoward tension on the vessels during the engagement process. During transperitoneal laparoscopic nephrectomies, anterior axillary line portals both cranially or caudad to the laparoscope portal were effective to autostaple the renal artery and vein (27). Clip application during pedicle dissection has been addressed in the general surgical literature (28,29). There are proponents for loop ligation and for titanium clipping. Urologically, the laparoscopic nephrectomy animal model indicated that clips were associated with more blood loss than autostapling techniques (31). Hemostasis in the closed environment imposed by minimal access surgery is one obstacle blocking progression to more complex intracorporeal techniques. The ability to maintain a clear surgical field allows complex tasks such as suturing to be performed. There are proponents for loop ligation and for titanium clipping. Urologically, the laparoscopic nephrectomy animal model indicated that clips were associated with more blood loss than autostapling techniques. aU.S. 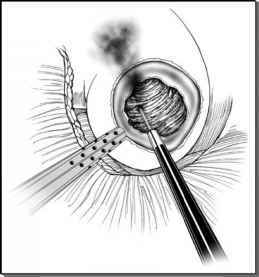 Surgical Corp., Norwalk, CT.
Current practice recommendations are to use 9-mm titanium clips to secure renal vessels. A total of five clips, three placed proximally and two on the specimen side, placed transversely in opposing directions prior to vessel division is recommended. Note: Each can be applied alone or in combination with the others. Anastomosis and complex enteric-uroepithelial composite appositions are the rule for urologic reconstruction. A number of synthetic, autograft, and xenograft materials have been sought to further diminish the trauma of urologic reconstruction. efficacious in a porcine animal model (27). En masse occlusion of the renal pedicle without separating the artery and vein, using a 12 mm vascular stapler has also been examined in animals. One of three animals followed for six months demonstrated an arteriovenous fistula on aortography (26). The true risk of arteriovenous fistula formation from en masse renal pedicle ligation may be even higher given previous studies documenting their formation 5 months to 40 years after surgery (32-34). Finally, a case where a partial nephrectomy was performed utilizing a linear cutting stapler has been described (35). Despite the widespread application of clipping and stapling technologies, there still exists a role for the use of suture in the management of the vascular pedicles during laparoscopic surgery. The most tried and true method of hemo-stasis remains the surgical ligature; it is cost effective and almost always readily available.